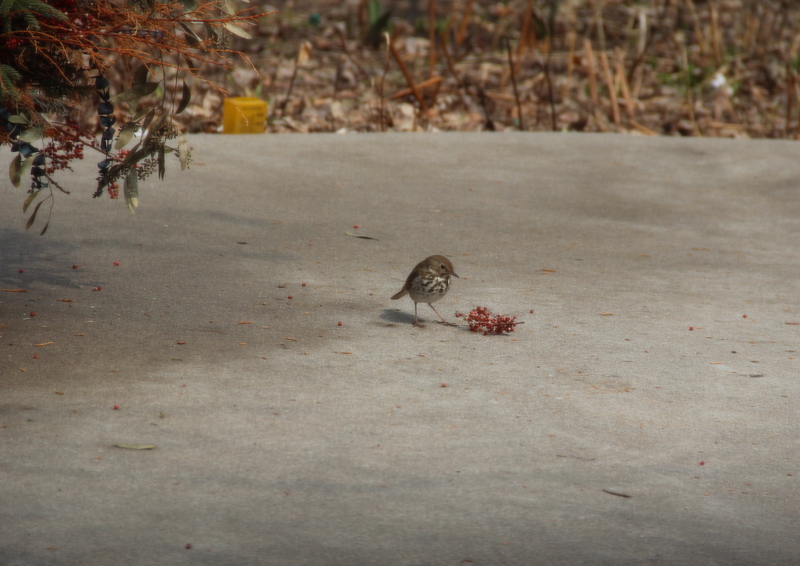 A hermit thrush eats berries from our patio planter. Recent strong winds brought a pair of migrating hermit thrushes to our backyard. Their brown backs, spotted breasts and rust-colored tails camouflaged them well among the leaves littering the gardens and against our winter-weary lawn. They plucked berries from a planter on the patio, picked in the grass under the suet and thistle feeders, and turned over leaves in the garden in search of food. Cousins to American robins, eastern bluebirds and several other thrushes, hermit thrushes may be the best singers of the family. Their song is flute-like, liquid, melodious. In Minnesota, these songsters spend the summer in the north-central and northeastern regions of the state. It is rare to hear a hermit thrush sing during migration, and over the many years that migrants have rested in our yard, I’ve heard their ethereal singing only once — when a bird perched in a tall arbor vitae and sang on a sunny morning. Watch and listen to a hermit thrush sing its haunting song. 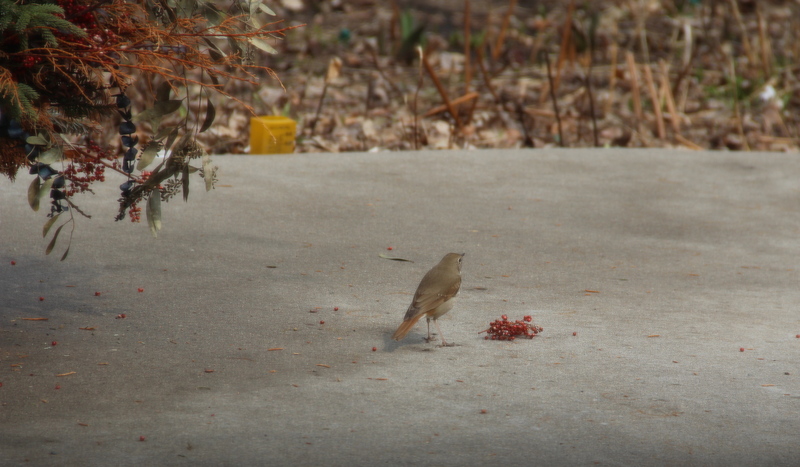 A rust-colored tail helps identify the hermit thrush. Some thrush species can be tough to tell apart because of the spotted breast and brown coloring shared by many. But, if the bird has a rusty tail that it flicks up and down, you’ll know you’ve likely spotted a hermit thrush! 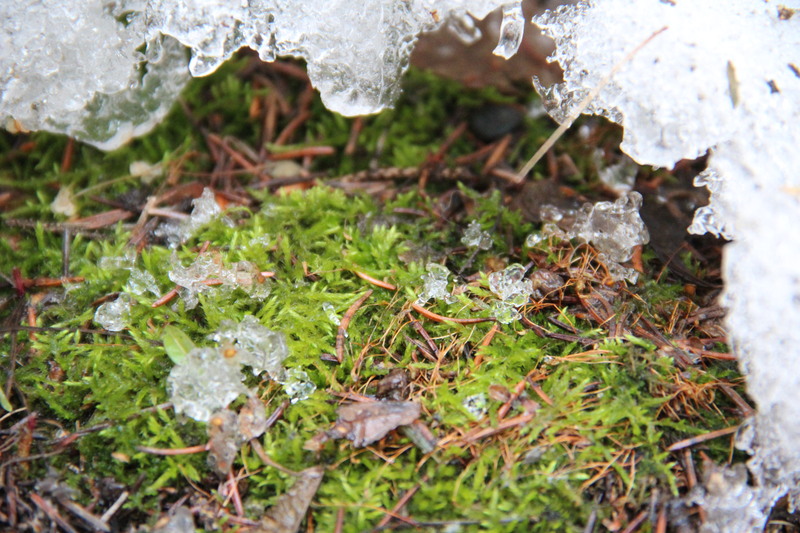 Melting snow waters and revives a tiny patch of moss. Early last week, I searched the few exposed patches of dirt for signs of bulbs pushing through the soil. No sign of bulbs in the north-facing garden, yet. Instead, I found the first bright green of the season: An oasis of moss tucked beneath a little cavern of melting snow under our spruce tree. Threaded with tiny seeds and spruce needles, the moss was the golden green of spring and droplets of melting snow refreshed it. Lovely, restful green; a beautiful, hopeful color after months of black and white.